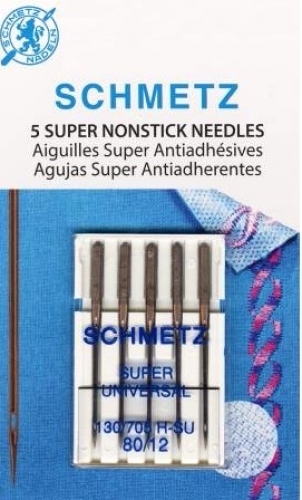 The NEW SCHMETZ Super Nonstick Needle has a slippery surface that ensures less adhesive residue sticks to the needle. Features A Super Universal Needle with a non-stick coating of NIT (Nickel-Phosphor-PTFE). Extra-large eye is suitable for embroidery work. The eye corresponds to a needle two sizes larger (i.e., the 70/10 Non Stick eye is similar to a size 90/14 regular Universal eye). Distinctive scarf with the special design of the eye ensures prevention of skipped stitches. Slightly rounded point provides trouble-free sewing on most materials. Strong conical blade reinforcement easily handles thick fabrics like denim. Five (5) needles per card. Used on Machine embroidery. Hook and loop tapes. General sewing.